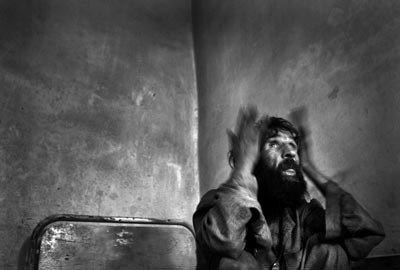 "war and insanity" War and Insanity: Abdulsabur, 35, wrestles with the voices inside his head as he sits in his bed in the mental ward at Ali Abad hospital in Kabul. Abdulsabur suffers from dementia due to brain damage from a bullet wound in the head. He was shot when the Taliban captured villages in the Shimali valley six years ago and attempted to disarm all of their residents. Abdulsabur, then a mujahadeen fighter, tried to escape with his weapon and was shot in the head by Taliban soldiers. His brother says his condition has deteriorated substantially in the past two years. He talks to himself almost continuously, sometimes shouting for the voices to go away and leave him alone. His condition is incurable.